Two months of the MLB season are almost in the books. May has been an utter disaster for the Blue Jays. They have not won consecutive games all month and they have won just 2 series all month (April 29-May 1st vs. the Twins and this past weekend against Philadelphia). With just 3 games left in the month, the Blue Jays will be below .500 for the month of May and the best they can do with their over all record is be at .500 if they sweep Boston. Here are ten random thoughts from the 8th week of the MLB season. 1. Ever since Roberto Osuna was put on administrative leave three weeks ago, the bullpen has been an utter disaster. Tyler Clippard blew both save opportunities he had, including giving up a grand slam against Oakland. John Axford was responsible for three of the A's five runs in that game. The Canadian reliever has given up 9 runs on 7 hits in his last 6 appearances. Danny Barnes has given up 5H and 2R in his last 4 appearances. 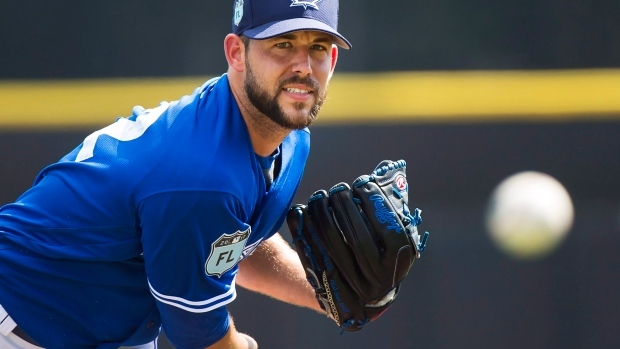 Ryan Tepera nearly blew the save on Friday. The Phillies loaded the bases with 1 out and their best hitter got a chance to win the game with two outs. Thankfully, Tepera got Odubel Herrera to ground out to end the game. Seunghwan Oh effectively put the game out of reach for the Blue Jays May 17 when he gave up 3 runs on 4 hits and a walk in 0.2 innings. Aaron Loup has been the Blue Jays most consistent reliever of late Loup has given up 3 runs (2 earned) on 6 hits and 4 walks in 11 appearances this month. A huge problem has been the starters inability to consistently pitch deep in games. Also, the Osuna absence has forced the relievers to pitch in situations that are not their strength. Pitching was supposed to be a strength of the Blue Jays, but so far that has not been the case. 2. The offence has also been slumping as of late. None of the Blue Jays regulars are hitting above .300. In fact, on the current roster just 3 batters are currently hitting above .300 and they are all pitchers (Deck McGuire 1.000, JA Happ .667 and Sam Gaviglio .333). Maybe it's time to consider doing what the Angels are doing with Shohei Ohtani and let a starting pitcher be available to pinch hit late in games. The Blue Jays need to figure out other ways to manufacture runs besides the long ball. This month, the Blue Jays had their first sacrifice bunt of the season as Richard Urena put down a beauty to put runners on 1st and 2nd with one out and Curtis Granderson and Josh Donaldson coming up next. Unfortunately they were unable to drive the runs in but it's these types of plays that the Blue Jays should be attempting more often. 3. Slowly but surely the Blue Jays are getting healthy again. Jaime Garcia made his return Saturday after missing a start with a forearm issue. Randal Grichuk will be back second. He is currently on a rehab assignment in advanced class A. Aledmys Diaz start his rehab assignment this week. Steve Pearce is currently running and throwing long-toss and is expected to begin hitting this week. Marcus Stroman long-tossed on Saturday and is expected to throw a bullpen session this week. Troy Tulowitizki will progress in his rehab and start running on flat ground. Tulo is the great unknown. How effective will he be after the injuries he's dealt with in the last year? He had surgery to remove bone spurs from both heels and missed the last 2 months of last season with a broken ankle. Most of the injured players should return in the next month. 4. With regular shortstop Troy Tulowitzki on the DL since the beginning of the season, the Blue Jays have tried 7 different players at the position this season: Aledmys Diaz, Yangervis Solarte, Richard Urena, Lourdes Gurriel Jr, Gio Urshela, Gift Ngoepe and Russell Martin. Shortstop is one of the hardest positions on the baseball field. Quite frankly playing the backup catcher in the field is a risky move because if Martin gets hurt and then Maile later in the game Kendrys Morales might be the only option and he hasn't caught a game in his MLB career. 5. How long will Blue Jays ownership/management let the struggles continue before they fire someone? John Gibbons would be the easy target to let go, but what is he supposed to do with inferior options due to injuries and poor play. It's possible the Blue Jays could also let pitching coach Pete Walker or hitting coach Brook Jacoby as these are 2 areas the Blue Jays have struggled mightily this month. I just don't see anyone getting fired until the end of the season unless the Blue Jays lose a bunch in a row. 6. In terms of trading options, the Blue Jays don't really have any assets off their current roster that teams would be interested in or that the Blue Jays would consider getting rid of. Of course the untouchables are prospects like Vladimir Guerrero Jr. and Bo Bichette. Most players on the big club and the AAA level are tradable assets. I can see a team taking a chance on Curtis Granderson or Kevin Pillar. John Axford and Seunghwan Oh are pitchers I can see teams valuing. You also have to look at the players available on other teams too. The Blue Jays will be looking for players they can control. At this point, they are likely to be sellers at the deadline unless they can turn things around on the field and quick. 7. The Houston Astros have a terrific pitching staff that is pitching to their potential at this time. Justin Verlander, acquired at the deadline last year, is having a career year with a 6-2 record and a sparkling 1.08 ERA. Four other Astros pitchers have an ERA below 2.00 (Gerritt Cole 1.86, Brad Peacock 1.83, Chris Devenski 1.45 and Colin McHugh 0.46). The Astros have a sparkling 34-18 record, good for second in the majors and will be a team that should go deep in the playoffs. 8. Chicago White Sox catcher Welington Castillo was suspended 80 games this week after testing positive for Erythropoietin (EPO) a banned substance. EPO promotes the production of red blood cells when blood oxygen levels are low. Castillo was batting .267 with 6HR and 15 RBI at the time of his suspension. He'll be eligible to return in mid-August. 9. A scary, scary moment in Boston. Top MLB prospect Ronald Acuna Jr. took a nasty spill running past first base. His left knee appeared to buckle on him as he extended. Acuna will certainly get an MRI to determine the extent of the damage and hopefully the sprain is minor and not severe. Warning: avert your eyes when watching the video, it looks gruesome.